The Chicago Monogram Design Center (MDC) brings designers to Chicago, Illinois, for two-day experiences to learn about Monogram, the design process, our appliances – and even cook with them! We interviewed each designer to learn a little more about their background and design experiences. Today’s profile highlights Ebony Stephenson with Criner Remodeling in Newport News, Virginia. Ebony: I became interested in design when I was a little girl playing with Lego’s, Lincoln Logs and dollhouses. One day I asked my parents for a new Barbie Dream House and when they said no, I grabbed some empty cardboard boxes and built my own. The rest is history. Ebony: A recent project that I really enjoyed was a whole first floor remodel in Yorktown, Virginia for Ross and Suzie Small. Their project consisted of an addition, kitchen, dining room, family room, and some exterior living spaces. I really got to enjoy this project because the clients were such a joy to work with. They really allowed me to think out of the box and do some really cool design features in their remodel. The best part was that they used GE appliances, of course. Ebony: I am not sure that there is a trend that I am over. I love for everyone to have their own styles, even if I do not agree with them sometimes. Ebony: The trend that I am most excited about is not following a trend at all. I have always thought out of the box and gone against the grain. I was never really one to follow a trend and I like to pass that thought process on to my clients. They are spending their hard-earned money to renovate their homes and I want the new look to fit THEIR personalities and THEIR design styles, not some stranger’s in a magazine halfway across the planet. SRFD: What did you learn in Chicago? Ebony: This trip was to the Monogram showroom in Chicago and it was amazing! I learned so much about all of the new products. The hands-on cooking experiences really helped me gain knowledge and further motivated me to sell these beautiful appliances to my clients. Also, being around a group of like-minded designers from all over the country and even Canada was an experience that I will never forget. Follow along with Ebony on Instagram. The Monogram Dream Kitchen Design Contest was created to celebrate the imagination and creative vision inherent in beautiful kitchen design. All designs were required to integrate Monogram appliances and were judged across several award categories. We announced the winners last month and will be profiling each of them on Save Room for Design over the next few months. The second place winner in Best Contemporary Kitchen Design is Mark White from Kitchen Encounters in Annapolis, Maryland. Mark: My dad was good at repurposing things into something new and useful and my sister always encouraged my creativity. When I was a kid I always liked to see houses under construction and imagine what the finished rooms would be. I even designed and built models of homes from cardboard and other materials when I was young because I thought it was fun. Mark: We helped our clients create a very special high-end kitchen using contemporary custom cabinets in an eclectic waterfront home. The homeowners are very creative and artistic and their vision included work from local artisans to complete the space with unique features. 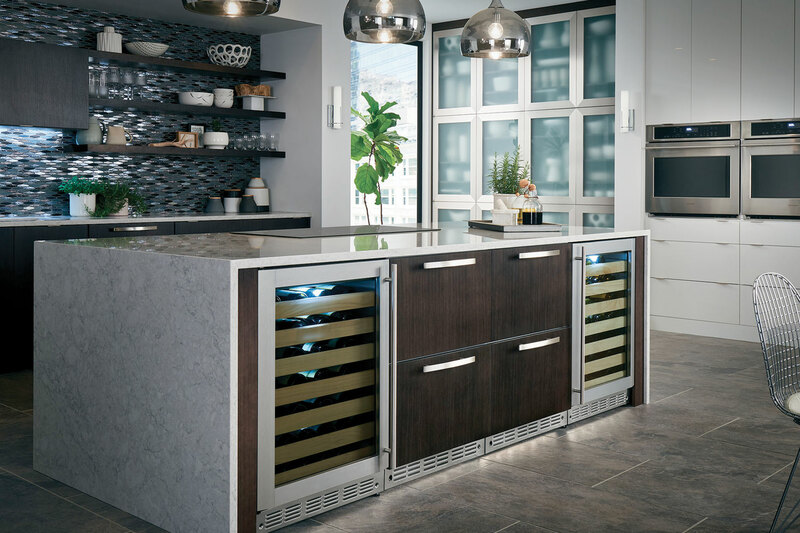 The cabinets are wrapped with beautiful natural edge timbers, custom inlaid glass panels are the focal point behind the range and custom forged hardware resembles icicles on some feature cabinets. The talented carpenters reused beautiful wood paneling on the walls and trim, the open beams were also wrapped in wood and the floors were laid in a large scale herring bone pattern that defines the spaces. A tall wall of finished cabinetry conceals the refrigerators, abundant storage and a matching flush door leads to the large “pantry” which is almost a complete second kitchen with an island. Mark: I don’t like cooking “niches” where the cooktop is surrounded by cabinets or tile work that comes down to the counter on both sides blocking access to adjacent work space. Mark: I embrace the increased interest in a clean uncluttered look which is often seen in contemporary designs but can also translate nicely in ”transitional” kitchens. Mark: The 80’s kitchen in this contemporary home was in desperate need of an update. Everything from the old tile floors to the unstylish cabinets needed to be replaced and there was significant opportunity to improve the layout for better function and improved flow to the adjacent areas. We started by exploring numerous layout options with the clients then combined the preferred design elements from different sketches to create the plan that would meet their needs and fit the space in the best possible way. An added window in the corner increases the panoramic view, brings in more natural light and creates better symmetry around the sink area. A new passage from the kitchen to the family room was added for a more convenient traffic pattern and a round wooden counter extends from the corner for added seating. The main work area consists of an L-shaped layout with an island. This arrangement includes the built-in refrigerator with TV above, an elevated dish washer with appliance garage, curved front corner sink cabinet and the cooktop with integrated curved front stainless chimney and glass backsplash. The island offers plenty of storage, knee space on the inside for the cook and room for three more stools for dining and entertaining. The soft curves make it easy to move around and compliment the overall design very well. The wall oven is on the back wall with landing space on both sides and extra storage by the sliding doors to the deck. The large walk-in pantry was reconfigured to allow for a wrap-around bar with sink, refrigerator drawers, additional storage and glass front upper cabinets. The new wood floors have an inlay at the step to the family room for better visibility and safety. The wood counter and ledge flank the entry from family room to kitchen and match the floors, support post and cylindrical pedestal at the stools. The entire transformation brought the kitchen up to today’s standards and meets all of the client’s desires for function and style. The first place winner in Best Traditional Kitchen Design is Sarah Robinson from Jansen Inc. in Pensacola, Florida. We profiled Sarah here on Save Room for Design earlier this year. “I found out about the contest after researching on the Monogram website. I had been in Louisville at the Monogram Experience Center the week before and learned so much! When I saw the call for submissions, I decided to submit a recent project. See more of Sarah’s designs on Houzz. Method Homes is a modern prefab builder based out of Seattle that focuses on well-designed, sustainable homes that are built offsite with a high level of craftsmanship and architectural detailing. We were thrilled to receive a call from Dwell discussing the possibility of building the Modern Monogram Home. As these things tend to materialize quickly, the timeline for design and construction was extremely tight. The Method, Dwell and Monogram teams worked in conjunction with the architects at Chris Pardo Design: Elemental Architecture to turn around a a fully engineered design and specifications over the course of several weeks instead of the months it would normally take. This is a testimony to the shared vision for the home and the design sensibility of the whole team. It is important for Method Homes to remain innovative in the home-building space. The collaboration with Monogram enabled us to focus on innovation by using state of the art appliances, a commercial double wall siding system, accordion doors and expansive window and door packages, and by designing a home that could withstand travel and multiple installations. Method Homes learned a lot about the logistics of a multi-city tour through the Monogram Modern Home experience and it was gratifying to see the reactions of all that visited in every city. The feedback we received is that visitors were impressed with the quality and materials in the home. We were pleased to see the home looking none the worse for all the travel when it got to it’s final tour stop in Boston. The home held up remarkably well and looked as new as when it left our plant months earlier. On October 6 -7, the Merchandise Mart in Chicago created the Midwest’s largest annual residential design conference for interior design, architecture, and luxury homebuilding called Design Chicago. Over 2,000 trade professionals attended. The focus was on kitchen, bath and home furnishings and included 120 showrooms located on three floors and over 600,000 square feet of the Merchandise Mart space. Presentations were made by the industry’s most acclaimed designers and thought leaders. Over 35 CEU courses were available, as well as showroom open houses, hospitality events and new product debuts. There was a Ones to Watch reception toasting up and coming designers. And the event culminated in a Gala celebrating top residential designers, architects, and luxury custom home builders. In the Monogram Design Center, we were excited to host a CEU on the The New Face of the Affluent Consumer-taught by Dwell CEO Michela O’Connor Abrams. The session was completely filled on the day it was announced, and received rave reviews from the attendees. She also hosted our afternoon showroom VIP designer cocktail event and shared a visual presentation on Dwell’s Take on Modern Design. It was a packed house with an excited crowd. The Monogram Design Center was a favored place during the event, with Chef Jon’s delicious light bites and a signature cocktails. How many designers does it take to design innovative appliances? As an Industrial Designer focused on appliance design, I pay attention to a wide variety of consumer product design. I look at design trends in interior design, electronic products, architecture, car design and even fashion. Trying to predict the future of appliance design, particularly of controls, is really challenging, especially as technology evolves at such a fast pace. Our goal is to be innovative but never to lose sight of the consumer’s needs as they relate to simple, intuitive interactions with machines. To this end, I have spent the last four months with a variety of people working on a project to predict the future of refrigerator dispenser controls. So how many designers does it take to design an innovative appliance? More than you’d think! Internally, I have worked with our awesome team of designers, Consumer Insights researchers, Product Managers, Engineers, Marketing Specialists, and Technology Gurus. But we don’t stop with the internal teams. The true experts are the people that use our appliances everyday, those who spec them for their clients, and the salespeople who sell them. To get this valuable input, we started listening. We held a design summit with top interior designers at our Monogram Design Center in Chicago. We traveled to the northeast to talk to key retailers about how they sell appliances and what their customers are looking for. And most importantly, we went into consumer’s homes to study how they interact with their appliances and ask what features they’d like to have. As we continue to move forward on this project, we will build prototypes and put them in front of consumers for testing and validation of our concepts. In the end, it isn’t just designers who design great appliances, it takes a village!